A leather tote is classic. It will always be in style due to its great shape and functionality. 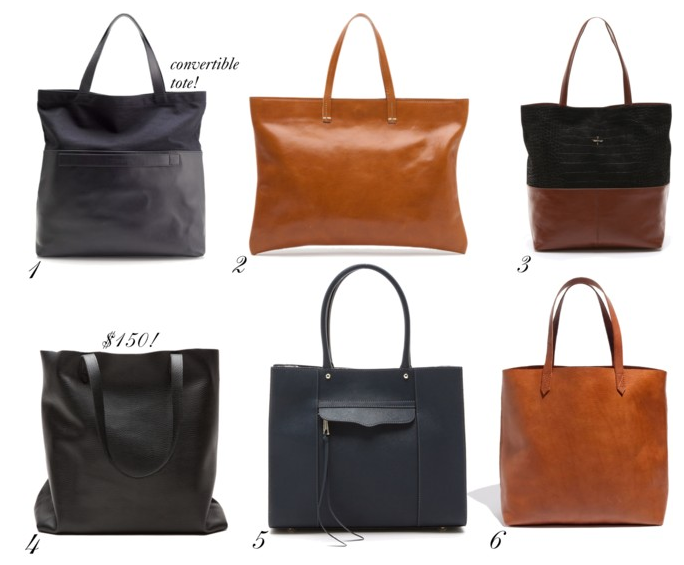 I've been bookmarking my favorite totes for a few months now and these are my Top Six. At some point in the near future, I'd like to invest in one of these beauties. Have you heard of Cuyana yet? I learned about them via 9to5Chic when she posted about their company in this post. I absolutely love their leather bags and especially the leather totes. Number four is the Cuyana Leather Tote in black, which also comes in tall and short and in a variety of beautiful colors. It's made from 100% Argentinian leather and is as elegant as they come. This one is at the tip-top of my wish list. Becky! These are amazing!!!!! Number 2 and 3 are gorgeous!! Great finds! That Madewell tote has been on my wish list for too long! Every time I see it I love it more! #2 is so super cute too! that madewell bag is perfection. Girl, you know I love that Madewell bag. You need it.